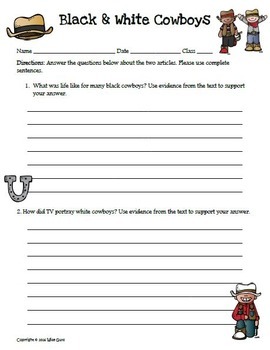 Here is a test prep activity titled Black Cowboys and White Cowboys. Informational text is a huge part of the new Common Core State Standards (CCSS). This document provides your students with two informational text articles that they will read and then answer questions based on the CCSS. 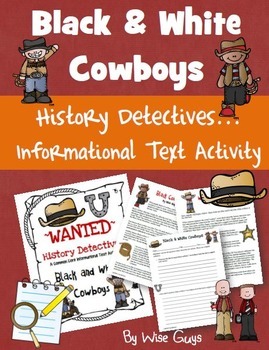 The History Detective topic for this activity is: about Black Cowboys and White Cowboys. 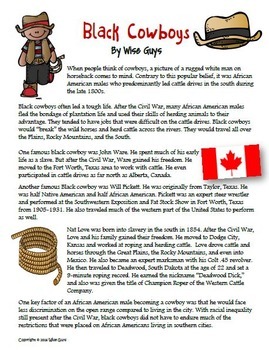 Students will read two articles about the different groups of cowboys, and then have to answer questions about the articles. They will have to use evidence from the text to explain their answers. Also included with the articles and student questions is an answer key, tips sheet, basic rubric, and the CCSS listed for this activity. Here is a great way for your students to learn more about these two topics, while practicing using informational text to answer questions. Make sure to check out our Test Prep Super Bundle that contains over 125 pages of resources to use before the test!